I was looking back at some prior essays on Agile and came across the April 2012 PMNetwork magazine. Specifically I was attracted (again) to page 58 for an interview with some agilists on the state of the practice. Agile project management embraces both “doing” agile and “being” agile—and the latter is the hardest. It defines a different management style: one of facilitation, collaboration, goal- and boundary-setting, and flexibility. ... agile is changing the way organizations measure success, moving from the traditional iron triangle of scope, schedule and cost to an agile triangle of value, quality and constraints. The first idea is certainly agile but not unique to Agile. To my way of thinking, all enlightened project managers have been doing this all along, or they should have been. 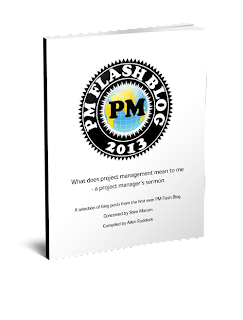 Now, I certainly agree that Agile calls for a reset of manager's and management's approach to projects. The project team gets an input because they are in the best place to judge feasibility. The second idea is Agile, but it may be too agile for some. Why so? First, there's still "other people's money". Second, you can't work with OPM and not have metrics of performance to stack up against the money. So, the cost-schedule-scope tension may be hard to manage, but at least there are metrics. I don't have a problem with another paradigm, say Highsmith's value, quality and constraints, so long as they come with metrics that align with the value that sponsors put on money. That's why I associate myself with best value: It's OPM with metrics for performance that align with a value proposition leading not only to project success but to business success as well. Agile is for Wimps .... ?